Although many pond owners like duckweed due to its beauty, and the manner in which it propagates, it can become a problem over time if not properly managed. 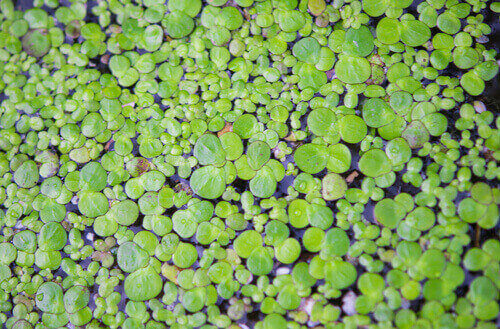 Some variants of duckweed don’t have roots and will instead absorb water and nutrients through its frond. It is also one of the smallest flowering plants in the world. The problem with duckweed lies in the rate at which it buds and then divides. Its population will double and triple rapidly, and is capable of covering a big pond in a matter of weeks. Once this happens, a number of issues can develop. First, they will block the rays of the sun from entering the water, which will result in the death of beneficial algae (which are responsible for keeping the water clean). Once the algae disappears, the nutrient levels within the water will grow exponentially, which will in turn lead to algae bloom and organic debris buildup. This will result in the spreading of anaerobic bacteria, which will increase the water’s toxicity and kill off your fish, plants and turtles. Size matters when it comes to duckweed management. Bigger ponds will be more challenging than smaller ones, because duckweed is quite fragile and doesn’t function well in water that moves frequently, so small ponds with waterfalls and fountains will usually keep it under control. Large ponds or lakes, on the other hand, are a different matter. Duckweed thrives in large bodies of water with little movement, and will grow both on animals and within waterways in a manner that will ultimately result in it taking over completely if it is not bought to heel. Furthermore, as duckweed spreads, it will become harder to eradicate. While some experts will recommend using herbicides, this isn’t the best solution. Rather, you will want to start by skimming out the duckweed, as much as possible. This can be accomplished with a skimmer or net, and is best done on a day that is windy, as the plants will display greater compression, usually on one of the pond’s sides. This simple technique requires no chemicals and is highly effective, though it requires a lot of manual work. Removing the duckweed manually should not be seen as permanent. In all likelihood you won’t get all the tiny plants, which means that they will return, and in some cases have been known to recover the pond in a single week. Once you’ve removed most of the duckweed however, you can begin the second phase of the elimination, which is designed to completely eradicate it. The second step in controlling duckweed in a large pond is the bubble aerator. It is similar to the fountain that you would use in a smaller pond, but it does a much better job at aeration and is designed for larger ponds. In fact, many commercial agricultural firms use them.